This is a website for the first edition of "Contemporary Art History: Japan". 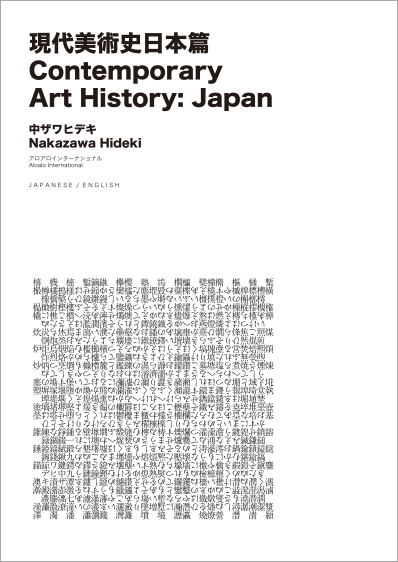 "Contemporary Art History: Japan" is a book written by artist NAKAZAWA Hideki. This site is made in person by NAKAZAWA Hideki. The first edition published by Aloalo International in 2008 was sold out. The revised edition will be published by Art Diver on November 21, 2014. The first edition's title was "現代美術史日本篇" in Japanese and "Contemporary Art History: Japan" in English. The revised edition's title will be "現代美術史日本篇 1945-2014" in Japanese and "Art History: Japan 1945-2014" in English. MOT annual 2004 Where do I come from? Where am I going? - Updated the contents drastically and changed the appearance. The revised version will be published by Art Diver in autumn, and the related lectures will be given at Bigakko in summer. Established the item "Revising in progress." - I updated the contents and changed the appearance succeeding to the day before yesterday. I changed the encoding from Shift_JIS into UTF-8, besides. - I updated the contents and changed the appearance of this page. - I changed the text from "The second edition will be published in autumn 2010" to "I am preparing a revised edition." - I moved the past annnouncements below.